When I started focusing on Intuitive Eating, I was in school getting my nutrition degree. There's no talk about intuitive eating in a nutrition program. In fact, besides nutrition counseling, it's all facts and science-based. On a side note, this is great because nutrition IS a science, and understanding anatomy, biochemistry, and medical nutritional therapy gives me a solid base of education as a Registered Dietitian, compared to other nutritional programs that may lack this. In classes, there's a lot of numbers - carbs, calories, % fat - and facts or guidelines - "eat 5+ fruits and veggies a day," "eat 20% of your diet from protein." Yet, intellectually knowing the science of nutrition doesn't translate into helping others develop healthy habits. You need to practice both the art and science of nutrition to balance intuitive eating with eating real food. The art is the ability to get out of the numbers-based, intellectual mind and into your intuitive-knowing body. It's taking these simple guidelines like eating more plants and noticing how it feels in your body. How is my energy when I'm eating a lot of plants? What foods feel best in my body? What foods don't feel that great in my body? How do I know when I'm hungry? Full? Satisfied? This is why I love the idea of eating real food. It's simple, and it can be truly satisfying to eat nourishing foods grown or raised from nature. Everyone knows that we should be eating more real foods, yet most people aren't doing it. A lot of people are trying to but are truly confused or frustrated. This is exactly why we need to connect to our bodies to develop and create sustainable habits. Think about all the rules you've picked up around nutrition or health throughout the years. You may have grabbed these from diets, blogs, health or fitness magazines, your friends or family, or even nutritionists or other health professionals. If I believed everything I read, I'd have nothing left to eat! I "should" have another veggie with dinner. I "should" get the salad for lunch. I "shouldn't" eat that cookie after lunch. I "should" skip the cake at my birthday. Ugh. Just reading these makes me want to rebel and eat a big plate of cookies for lunch. These rules keep you feeling in control, yet, all they do is strengthen your diet mindset. Sure, they may work for a while, and you can use all your willpower to try to control your body's cravings and desires. Yet, with time - hours, days, weeks - your inner rebellious self shows up demanding all the cookies and cake. All those days ignoring your craving or trying to brush your teeth or drink water to get rid of it are gone. So, you binge and go all out. Since you've created rules around what you're allowed or not allowed to do, you feel guilt instantly. This guilt comes from breaking your rule - and a societal "health" rule - and grows. Your only choice becomes restricting your next meal, "being good," or burning off those extra calories with a torturous few hours on the elliptical. You feel trapped in this back and forth cycle - all with those negative, body-hating thoughts to accompany you. You're trying to be healthy because you know what you SHOULD do, but you're so upset and frustrated that you can't do it. Here's the secret: The rules have to come from in your BODY. They're probably not really rules either. When your body's leading the way, you'll discover a style of eating that nourishes your unique body. You'll eat based on your body's cues for hunger and stop when you're feeling satisfied. Eating can become a pleasurable experience because your body thrives on pleasure. The funny thing is intuitive eating can look very similar to eating real food. When I'm tuned into my body's needs and desires, I'm eating 'real food' and typically 3-5 balanced meals or snacks a day. By removing rules from my diet, that's what I naturally choose to eat because it energizes and nourishes my body. Yet, I can also choose to eat chocolate each day without any guilt because I'm not breaking any rules, and I'm absolutely allowed to indulge in daily pleasures. For full transparency, intuitive eating for me also means that somedays, I barely touch a vegetable. On other days, I'm so enthralled in my work that I forget to eat and just grab something quick on the go...or *gasp! * a gas station snack that likely has some added sugar or vegetable oils (not very 'real-food' of me). This is intuitive eating in real life - these are rare occasions but of course, they happen. Yet, I don't get upset because I trust that my body will balance things out. Sure enough, after a weekend away, all I want is greens and nourishing meals at home. I mention this because in the beginning of your intuitive eating journey, you may have to let go of health advice and give yourself full permission to eat and enjoy your 'off-limits' foods...even if all you're eating is cookies and chips. Notice what rules you're holding on to. Play around with breaking just one of these rules this week. Stop yourself when you're using "shoulds" or "shouldn'ts." Tune in to your BODY, and ask yourself questions from that place. Stay committed to what works for YOU rather than what works for someone else. 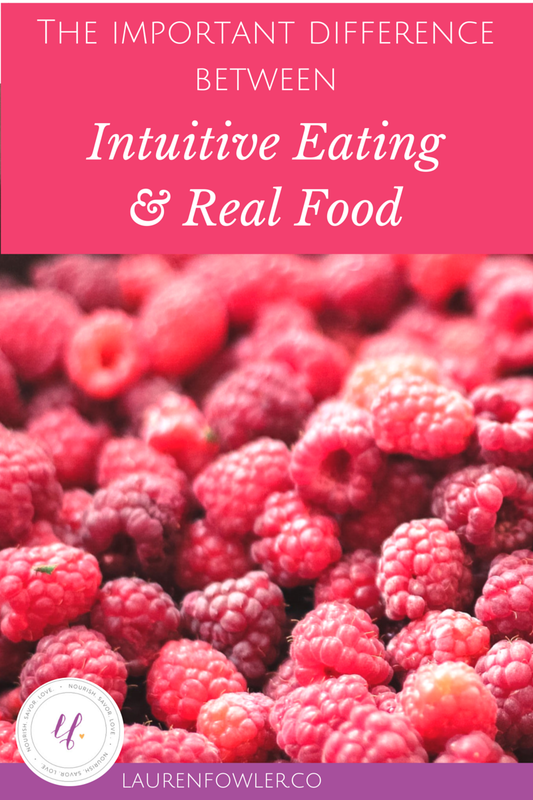 I put together a resource guide to help you explore intuitive eating, self-care, and real-food nutrition. Grab it here!